Ethan Boy · Ethan is three years old! Ethan turned three on January 31st 2009.Â Having survived the “terrible twos”, are we allowed to heave a sigh of relief now? On the contrary…I think not! He was weighed in at about 29.3lbs when he visited the doctor last month, and that converts to about 13.3kilos. He is becoming more assertive in his actions, and knows how to take his stand when he wants something.Â Surely a sign of independence, but sometimes can lead to tempers too.Â He even says, “NO! Don’t do that!” when it suits the situation. Loves to show us what he has built or done, especially with his Lego set.Â He’ll go, “Look! Look!” while proudly displaying his masterpiece. Depending on his mood, he will eat a lot or very little.Â There have been times when he will finish 2 whole bowls of rice, and sometimes he would even take the chicken meat.Â But sometimes, he would reject rice completely, choosing only to have bread or cheese or muffins or chocolate milk. Joyce says: Errr…why the laugh? And, Happy Chap Goh May to you and yours! Happy 3rd birthday, Ethan. You’re becoming more charming every day! That “Miss you Daddy” will surely melt Daddy’s heart. 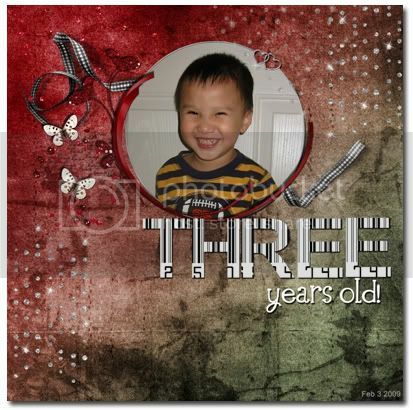 happy belated 3 yr old Ethan!